Similkameen winemaker Lawrence Herder enjoyed a moment of revelation last week at the hands of Austrian wine glass manufacturer Georg Riedel. It happened at a seminar and tasting during the Vancouver Playhouse International Wine Festival. Herder’s 2006 Bellamay Vineyards Pinot Noir was one of the wines used by Riedel to show the importance of matching wines to properly designed wine glasses. “No other grape variety is as sensitive to the wine glass as is Pinot Noir,” Riedel said. He then proceeded to lead the group through tastings in which the Herder wine was sampled from a Pinot Noir glass, then from a Chardonnay glass, a Cabernet Sauvignon glass, a Riesling glass and a plastic tumbler. The Pinot Noir was particularly ill-served in the Chardonnay glass and, of course, was totally destroyed by the tumbler. But in the proper glass, the wine is a marvellous 90-point Pinot Noir. The aroma expresses almost jammy cherry notes. On the palate, the flavours include spice and strawberries. The texture is the classic silken Pinot Noir texture, creating the sensation that this is a full-bodied wine. The finish is long and lingering. All these excellent qualities showed so well in the tulip-shaped Pinot Noir glass that even the winemaker was shaking his head in amazed delight. Now, he is asking himself whether he needs to have some of the elaborate Riedel stemware in his Similkameen tasting room. For Georg Riedel, it was another mission accomplished. “I’m here to complicate your wine life,” he jokes. It was his father in the 1950s who conceived the idea of designing “wine friendly” wine glasses. Over the last two decades, Georg, the 10th generation Riedel to produce crystal, has taken this to a new level. His company’s current catalogue runs to 50 pages, with stemware designed for every major grape variety or beverage, and quite a few besides. If you have ever wondered what wine glass in which to serve Beaujolais Nouveau, Riedel has one. Riedel recalled the first time he sat Robert Mondavi down to taste a series of wines in different glasses. Mondavi announced before the tasting that this was just a load of rubbish. By the end of the tasting, he was one of Riedel’s strongest converts. It stands to reason that a wine glass should be designed to make the best of any wine’s strongest points, especially the aroma. “Eighty percent of the enjoyment of food and wine is olfactory,” Riedel maintains. The rest is divided between the feel of the wine on the palate and the taste. “What you think you taste, you actually smell,” he says. Riedel wine glasses come in a several series but the basic engineering principles are much the same. The Pinot Noir glass has a fat tummy but it pinches in slightly at the top of a fairly long chimney. The design allows the wine to release its aromas while controlling the rate at which the aromas escape. The shape of the wine glass lip delivers wine the appropriate part of the palate. A Pinot Noir needs to hit that part of the tongue most sensitive to the fruit and the silky texture. Herder’s Pinot Noir was put through its paces with stemware from Riedel’s Vitis line, designs created in 2007. Elegantly tall and contemporary, these are machine-made lead crystal, somewhat more affordable than hand-blown stemware in Riedel’s classic Sommelier line. Perhaps even affordable enough for a wine shop in the Similkameen! Chalk up another win for the Okanagan wine region: Pascal Madevon, the winemaker for Osoyoos Larose, is about to become a Canadian citizen. Born in Paris in 1963, Pascal arrived in the Okanagan just days before the 2001 vintage, the first at the Osoyoos Larose vintage. Astonished at the quality of the grapes, hardly something he expected, he soon decided he was not going back to Bordeaux to make wine. He moved his family here in the summer of 2002. It is a profound validation of the Okanagan when an experienced French winemaker prefers to make his career in the Okanagan. It is even more telling how many other top winemakers have settled in the Okanagan and not in the regions where they started. For example: Tom DiBello, CedarCreek’s California-trained winemaker, says there is no other place in the world where he would rather make wine. Pascal had an urban upbringing and studied mathematics in high school before enrolling in winemaking studies at the University of Bordeaux. At the time, he had never even been on a tractor. He got diplomas in both viticulture and enology because he believes a winemaker needs both skills. “I wanted to know everything about wine,” he says. 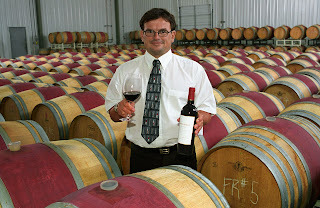 Eleven years of his winemaking career in France was spent at Château La Tour-Blanche, a cru bourgeois of Médoc. In addition to making wine, Pascal wrote two wine books, one of which has gone through several editions and sold 25,000 copies. He was managing Château La Tour-Carnet, a fourth growth, when he was recruited for the Okanagan by Groupe Taillan, the joint venture partner with Vincor Canada in the Osoyoos Larose project. Groupe Taillan has several top Bordeaux estates, including Château Ferriere of Margaux, Château Chasse-Spleen, Château Citran and Château Gruaud Larose. The latter inspired half of the Okanagan winery’s name; the other half comes from the town of Osoyoos, a short distance from the vineyard. Pascal continues to be in awe of how well the Bordeaux varietals grow in the south Okanagan’s dry and healthy climate. He was alerted to this in the first vintage when, a few weeks after harvest, he found a bucket of grapes that had been forgotten in the vineyard. Due to the dry climate, the grapes had barely deteriorated. If the same thing had happen in Bordeaux, where rain often occurs late in the season, the grapes would have been rotten. The other appeal of the Okanagan, Pascal says, was the egalitarian spirit compared with the hierarchical social structure in France. Here, he has had good friends among his cellar and vineyard workers as well as among his winemaking peers and his employers. In the style of a French château, Osoyoos Larose has only two wines (both reds). Le Grand Vin is the flagship. The wines remaining when that blend has been assembled go into a second label, Pétales d’Osoyoos. The style of these wines is reminiscent of Bordeaux reds – but don’t try telling that to Pascal. “It is first an Okanagan wine,” he bristles. Our gain is Bordeaux’s loss. The fans of Burrowing Owl wines will be excited to learn that the winery is maturing three barrels of its first port-style wine. This was disclosed during a Burrowing Owl winery dinner this week at Vancouver’s Glowbal Grill and Satay Bar. The dinner is part of this year’s Vancouver Playhouse International Wine Festival. According to Burrowing Owl proprietor Jim Wyse, the “port” is made with Syrah grapes, with the winery’s staff crushing the grapes by foot. That has been the tradition in Portugal (although labour shortages have forced the invention of mechanical devices). Stomping grapes is not a gimmick. In making port, the wine does not remain in contact with the skins as long as it does in making table wines. The challenge, therefore, is how to extract as much colour and flavour as possible. Crushing the grapes by foot does a more effective job than a mechanical crusher at breaking down the grapes, liberating colour and taste, all without bruising the seeds, which might release bitter notes. There was a bit of serendipity behind the Burrowing Owl “port.” The winery had to reduce the alcohol in one vintage of Pinot Gris. Many wineries do this commonly, using reverse osmosis in super-ripe vintages in order to avoid alcohol levels higher than 15%. Aside from possible tax implications, some high alcohol wines, notably whites, can taste unpleasantly hot. After dealing with the Pinot Gris, Burrowing Owl decided to use the recovered alcohol to fortify a Syrah “port.” This is also traditional. In Portugal, port wines are allowed to ferment to around eight percent alcohol; then brandy is added to bring the alcohol to 18%-20%. This stops fermentation while preserving the natural sweetness of the wine. Port seems a natural extension of Burrowing Owl’s style. The reds here have always been big, ripe and full of flavour. “That’s because those are the kind of wines I like to drink,” Wyse says. The 2006 Syrah is the vintage currently available at the winery. It is a dark, brooding wine, ripe (14.5% alcohol) with concentrated flavours of plums and prunes, with an earthy spice. It is easy to see taking this wonderful wine to the next level in a port. 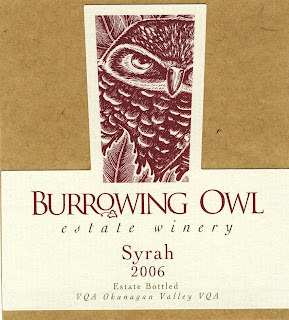 The other good news (from Chris Wyse, the winery’s general manager) is that Burrowing Owl in 2007 bought a 30-acre vineyard just southeast of Osoyoos. It is a great site for red varieties. The vineyard grows Merlot, Cabernet Sauvignon, Syrah – as well as Malbec and Petit Verdot. The latter two will probably be added to the winery’s superb Meritage. However, it is always possible that Burrowing Owl will consider offering varietals from these two as well. If Ontario’s wine region lacks in scenery compared with the Okanagan, it more than compensates with history. Consider the story of the Woodruff House in the village of St. David’s, the home of Ravine Vineyard Estate Winery, one of the most exciting among Ontario’s new wineries. The house was built in 1802 by a settler named William Woodruff. It was destroyed during the War of 1812 when the American army burned the entire village in 1814. Woodruff rebuilt it in 1815 and his family lived there into the early 1900s. Then the 3,500-square foot building was subdivided into rooms that were rented to immigrants over the next 60 or so years. Accordingly, the villagers called it The House of Nations. At that point, the life of the house took a strange turn. New owners dismantled it and moved the pieces to the Ontario village of Caledon. They never got around to rebuilding it. Instead, the house, always in pieces (including bricks and hearth), was resold and moved several more times. In 2003 Blair and Norma Jean Harber, the developers (with their sons) of Ravine Vineyard, took over the farm which included the original Woodruff House site. The farm had been in Norma Jean’s family, the Lowery family, since 1867. The Lowery family planted some of the very first vineyards near St. David’s in 1869. In the early part of this decade, real estate developers were threatening to put housing on land including the Woodruff House site, taking advantage of its great views over vineyards. The Harbers wrestled it away from development when, in 2005, they planted a 25-acre vineyard. This is one of the finest vineyard sites near Niagara on the Lake. It occupies one of the few significant slopes in the area and the soils, the shoreline of an ancient lake, are more complex than elsewhere on the St. David’s Bench. Norma Jean had the inspiration to Google “Woodruff House” and, to everyone’s surprise, learned the house still existed and still was in pieces. The Harbers bought it. Workmen have just finished putting it back together again, about 1,000 meters from its original site. Finished with original or reclaimed materials for the most part (the tasting bar is 200-year-old cherry wood), the Woodruff House now serves as the tasting room and part of the winery for Ravine Vineyards. There’s more history! Apparently, William Lyon Mackenzie hid in the house during the 1837 rebellion, escaping from a second-floor window. On another occasion, an artist peripherally associated with The Group of Seven painted a picture of the house. The Harbers now own the canvass and intend to display it the building. The Harber side of the family has made its money through a 60-year-old company in Fort Erie called Harber Manufacturing Ltd. Today, it makes sheet metals products, including bodies for racing cars, and high-tech filtration systems. In the past, it has built boats. “My grandfather started the company by inventing folding lawn chairs,” says Paul Harber, a fledging chef who is one of Blair and Norma Jean’s sons. While his brother Alex is studying viticulture, Paul is in Europe to hone his culinary skills. Ravine’s long-term plans call for a fine dining restaurant next to the winery. Already, a lively on-site bistro operated by the renowned culinary team of Michael and Anna Olsen is crowded most days of the week with a local clientele, many of them employed by nearby wineries. Even with all this history and culinary excellence, the wines steal the show. The Harbers retained consultant Peter Gamble as Ravine’s winemaker. Since beginning his wine industry career more than 25 years ago, Gamble has launched several leading wineries in Ontario. Currently, he also has clients in Nova Scotia, British Columbia and Britain and, with wife Ann Sperling, has an emerging winery in Argentina. The philosophy at Ravine is premium, with only three of the 16 wines on the current list selling for less than $20 a bottle, and with the reserves selling for $55. However, the quality is there across the range. By coincidence, the Riesling in this vineyard was planted near a small creek. Gamble was delighted to discover that the creek creates the conditions here for botrytis. As a result, he makes luscious, honeyed off-dry Rieslings with moderate alcohol. The 2007 Ravine Riesling ($28, 94 points) is an exceptional wine, showing a core of honey and fruit. The 2007 Ravine Chardonnay Reserve ($38, 92 points) is classically Burgundian, with aromas of toast, hazelnut and marmalade, leading to rich, buttery citrus flavours. The regular 2007 Chardonnay ($24, 88 points), made with purchased grapes, has a fleshy texture and citrus flavours with spice on the finish. The 2007 Redcoat ($19, 87 points) is a blend of Cabernet Sauvignon, Merlot and Cabernet Franc. Gamble made it specifically as a soft, early-drinking red for Olsen bistro and for anywhere else that wine and food are paired. Ravine’s 2007 Meritage ($24, 88) is a similar blend led by Cabernet Franc. It is fuller and firmer, with generous notes of plum and black currant. It is structured to benefit from cellaring. It is worth noting that the 2007 vintage in the Niagara wine region was one of the best ever – a dry, hot season that produced ripe, healthy grapes with tons of flavour. It shows in the Ravine wines. The winery’s 2007 Cabernet Franc ($32, 88 points with potential to achieve 92 with cellaring) is firm, concentrated and brooding. The winery’s 2006 Cabernet Franc ($34, 88) is at this stage a more accessible vintage, with flavours of cherry and chocolate. The wine’s vibrant flavours are ever so appealing. The superiority of the 2007 reds show in comparing the winery’s 2006 Merlot ($36, 87) with the 2007 Merlot ($34, 90 points). The 2006 is luscious, with spicy plum notes on the finish. The 2007 is rich and plush in texture, with long ripe tannins and with intriguing blueberry aromas and currant flavours. The winery also offers a 2007 Reserve Merlot ($55, 93), an intense, concentrated wine with flavours of black cherry and cassis framed with good oak. This is a wine capable of aging 10 to 15 years. Ravine’s 2007 Cabernet Sauvignon ($37, 91+) shows how well this late-ripening variety did in that superb vintage. This fine-textured, concentrated wine is packed with ripe red berry flavours. The wine will be released this summer. Also being released this summer is the winery’s tour de force, the Ravine 2007 Reserve Red ($55, 91+). No tasting notes were yet available but the wine clearly is another blend of Bordeaux varietals. It is an intense, chewy wine, tasting of prunes, chocolate, tobacco and finishing with an intriguing earthy note. Across the board, the wines – even from a hot year like 2007 – have moderate levels of alcohol, usually under 13%, but they all taste completely ripe. Gamble attributes that to the vineyard. “What I love about this property is the great expression of flavour at lower [alcohol] numbers,” he says. Kudos to the Harbers for keeping the property in agriculture. The trio of 2008 whites being released on April 1 by CedarCreek Estate Winery all sport smart new labels, part of a dramatic overhauling of that winery’s portfolio. The labels are the tip of the iceberg. More significantly, the winery is reducing its portfolio to 16 wines from 24 by eliminating almost entirely its mid-tier Estate Select wines that currently sell from $20 to $35 a bottle. The winery is retaining its super-premium line, called Platinum Reserve. Selling at $35 and above, these limited production wines represent the best of the best from CedarCreek. The mid-tier range is being amalgamated with what the winery previously called its “classic” range. The range that emerges will sell for $20 or less a bottle, with a lift in quality that should over-deliver. The largest part of the winery’s annual production, which totals about 40,000 cases, will be dedicated to this range. This is how it works. CedarCreek’s Estate Select Merlot currently retails for $30 a bottle. In the future, most of that juice goes into the regular Merlot, selling for $20. This is a savvy business strategy. It is no secret that, in the current economy, consumers have been buying fewer mid-priced wines while shopping through value-priced selections. CedarCreek is aiming most of its wines at the sweet spot that consumers of B.C. wines are prepared to accept. While CedarCreek seems to be reducing its average pricing across the board, the winery will not be cutting any corners with quality. Since 1998, CedarCreek has improved its vineyards significantly and has recently developed two more vineyards at Osoyoos, planted to Bordeaux reds, Syrah and Viognier. Look for CedarCreek to be more aggressive in its marketing as well. Gordon says that the winery has been too modest in the past. It has much to blow its horn about: Canada’s winery of the year twice in the last decade and finalist three more times, to say nothing of its other accomplishments in national and international competitions. There are Okanagan wineries with cult followings that have not shown as well at competition. The winery is also switching to screw cap closures for most of its wines, retaining corks (two-inch premium corks) for its Platinum Reserve wines. The screw cap is a superb closure for three 2008 aromatic whites just being released – the Riesling, the Gewürztraminer and the Ehrenfelser. All are priced at $18. 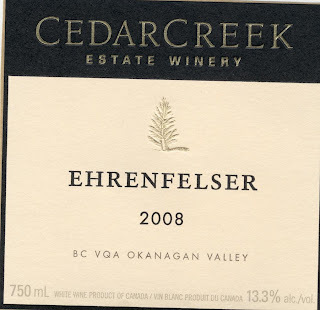 The grapes for CedarCreek’s Ehrenfelser come from a grower’s vineyard near Westbank that was planted more than 30 years ago. Mature vines often yield the highest quality grapes. In 2002 CedarCreek’s viticulturist made what the winery calls “an educated guess” about how to manage the vines. The canopy of leaves was thinned, allowing more sun to reach the grapes. This has promoted the lush, ripe flavours and aromas in the wine. Tom DiBello, the winemaker, ferments this wine (and the other aromatic wines) at unusually low temperatures to preserve all the floral and tropical characters. The result – Canada’s best Ehrenfelser. Maybe the world’s best Ehrenfelser. The variety, by the way, was developed in Geisenheim and was named for the romantic ruined Schloss Ehrenfels on the Rhine, just west of Rüdesheim. At Ontario’s Le Clos Jordanne winery, the site for the Frank Gehry-designed winery has now been planted to grape vines. Scratch a great - but probably unaffordable – building that, if erected, would have ensured a place for Ontario wines on the world map all by itself. Launched in 2000, Le Clos Jordanne is a joint venture between Vincor Canada and Groupe Boisset of Burgundy. While developing four vineyards on the Jordan Bench, the partners commissioned Gehry to design the winery. The Canadian-born architect is known internationally for dramatic buildings, such as the stunning Guggenheim Museum in Bilbao. He produced drawings for what would have been the most remarkable winery building in Canada, a shimmering silvery structure with a billowing roof inspired by clouds over a vineyard. It would have been a tourist magnet to Ontario wine country, just as the Guggenheim has transformed tourism in Bilbao. A year or so after the designed was completed. Vincor was taken over by Constellation Brands, the world’s biggest wine producer. There has been no announcement that Constellation’s practical accountants appear to have axed the Gehry winery. Since vines now grow on the site formerly set aside for it, that conclusion seems logical. That’s the bad news. The good news is that the rest of the project is moving ahead. Canadian-born wine maker Thomas Bachelder is making exceptional Pinot Noirs and Chardonnays. The winery has now released its 2006 wines (9,000 cases were made that year). It has 10,000 cases of 2007 and 11,000 cases of 2008 in barrels or tanks. When all of its 52 hectares of vineyard are in full production, the winery expects to make about 16,000 cases a year (cases of six). Thomas continues to work in the so-called temporary winery that that the joint venture rented, a homely green building beside the busy Queen Elizabeth Highway. The building formerly served a flower company and the cold rooms in which the flowers were stored have become admirable barrel cellars. The facility may not be pretty but it is adequate for wine-making. It is about four kilometres from the Le Clos vineyards. Because there are no vineyards at the building itself, Le Clos is not able to operate a retail store or a tasting room at the winery. The wines are all sold directly to restaurants and to internet buyers. These are wines that define some of the future directions for Niagara wine. Thomas trained and worked in Burgundy and in Oregon before being recruited to manage Le Clos Jordanne and to make the wines. There are signs of Burgundy all over his crowded office, from a vineyard map to an empty Burgundy bottle on his desk. His entire winemaking career – and he has been at it for nearly a quarter of a century – has been dedicated to Pinot Noir and Chardonnay. He is driving Le Clos with a Burgundy template. Le Clos has four vineyards, all are on benches just below the Niagara Escarpment, near the village of Jordan. Most of the vines were planted in 2000 and 2002. As the vines mature, Thomas is taking pains to identify the qualities of each vineyard and to identify the superior blocks of vines. Le Clos’s best wines – its single vineyard wines – come from such blocks. The wines that are not quite so singular go into Le Clos’s Village Reserve range. These are still excellent wines but they do not show the individuality of the single vineyard wines. Thomas believes that “wine should taste like it comes from somewhere.” A very Burgundian notion. Le Clos current release is from the 2006 vintage. (It’s first vintage was 2004, not counting 300 cases of Pinot Noir made in 2003.) Before we got to a tasting of some of the current wines, Thomas and I tasted the vintages still in barrel or tank. The 2007 vintage in Ontario was dry and hot. All the Le Clos Pinot Noirs are remarkably dark with flavours that have a meaty boldness at this stage. These are probably not typical Ontario Pinot Noirs but they will be tremendously satisfying to drink. Even in a big ripe year like 2007, the Le Clos single vineyard wines show noticeable individual personalities – more minerals from Claystone Terrace, more delicate finesse from La Petite Vineyard, for example. That’s how terroir should work. The vineyard differences are more obvious in the 2008 barrel samples. Wines from a cooler year, these Pinot Noirs are lighter but possess considerable feminine charm and delicacy. It was obviously a good Pinot Noir year, at least on the Jordan Bench.